is now online, please 'LIKE' us ! 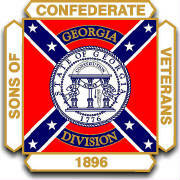 and is a camp in good standing with the Son's of Confederate Veterans. we serve the cities of: Waco, Tallapoosa, Bremen, and Buchanan. very dedicated to preserving our Southern Heritage. 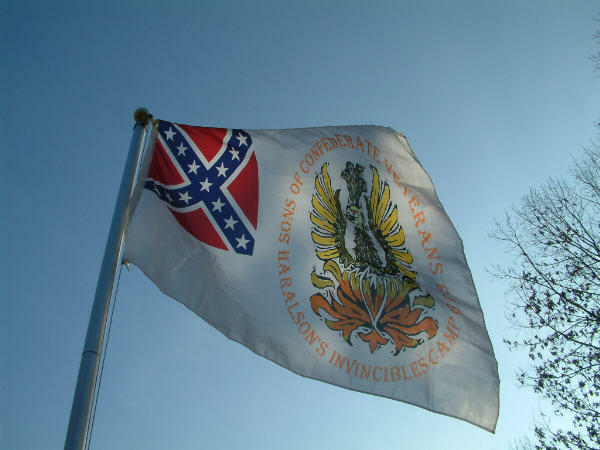 Our camp was named to honor the men of the 40th Georgia, Co. K.
They were named the Haralson Invincibles. The Haralson Invincibles Camp had been dormant for six years. 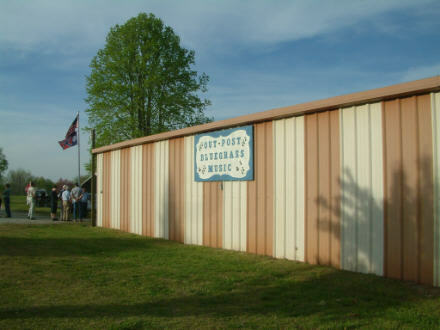 Upon the request of the Upper Division Commander, Charlie Lott, in 2004, Curtis "Bear" Hamrick was appointed the Commander of the camp. At the same time, one of the former members of the camp was appointed Lt. Commander and our Adjutant transferred in from another camp. lb. 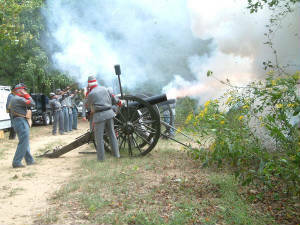 Napoleon Cannon that was donated to us and was christened, "The Preacher". We have several positions that are available that a man such as yourself might want to fill. Age requirements must meet that of the National By-laws of: 12 years of age or older. We also have Cadets that range from 11 and younger for a child, brother, or friend. If you have a wife or daughter who is interested in dressing in the style of the Antebellum period we have the "BELLES" that recreate and tell the story of Women before, during and after the War Between the States. We are an organization devoted to the family! We have chosen for our camp logo, The Phoenix. 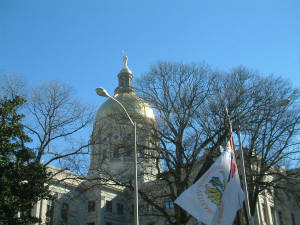 "As it rises from the ashes to live again, so too has the Haralson's Invincibles Camp 673." We begin at 6:30 PM.with a covered dish supper and our meeting begins at 7:00 PM. So join us for Supper and discover what the SCV has to offer for you! To improve Haralson County ( Bremen, Tallapoosa, Buchanan, Waco), East Cleburne County(Al), and northern Carroll County (Ga). 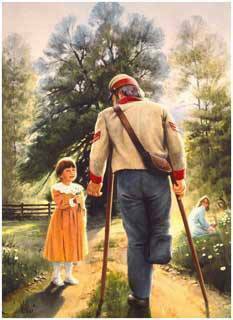 To educate them on the truth about the War Between the States through Living History events at local schools, festivals and parades. Holding Memorial Services honoring our Confederate Heroes. Upkeep of Cemeteries where they are buried, marking their graves with headstones. to have their own "Dishonest Abe" Portrayed by: Lt. Commander Richard Boarts. Richard is a great asset to have at Living Histories. at Haralson County Middle School. 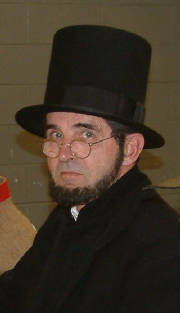 Children and adults alike are enthusiastic to see Abraham Lincoln come to life through Lt. Commander Boarts. The public then learns about American History they never knew existed! When Lincoln walks onto the stage an applause can be heard and a quiet hush falls on the crowd as President Lincoln is interviewed by a Confederate Newsreporter. So come to a Haralson Invincibles function, you never know when "Dishonest Abe" might appear! Logo in the white field. The Men of the Haralson Invincibles. How to find where we meet. Take I-20 West to exit # 5 Tallapoosa/Bowdon. At the end of the ramp, turn left on Hwy 100 south toward Bowdon. Travel 0.8 miles and turn right on Carlton Johnson road beside the J&J Shoppette. Go 1.3 miles to dead end. Turn right onto Old Highway 100 North and go 0.3 miles to the Outpost Bluegrass Music Barn on right. Just follow the signs.